In these tasty beet and brown rice burgers, red wine vinegar is the secret ingredient, bringing a slightly floral and acidic note to the burger. Searing this delicate burger on high heat at the beginning of the cooking process is important; the crust that forms is what helps the burger keep its shape. Recipe from Veggie Burgers Every Which Way: Fresh, Flavorful and Healthy Vegan and Vegetarian Burgers—Plus Toppings, Sides, Buns and More, copyright © Lukas Volger, 2010. Photo by Christina Heaston. Reprinted by permission of the publisher, The Experiment, LLC. In these tasty beet and brown rice burgers, red wine vinegar is the secret ingredient, bringing a slightly floral and acidic note to the burger. Using the large holes of a box grater or the grater blade of your food processor, grate the beets. In a large, lidded sauté́ pan, heat 2 tablespoons of the oil over medium heat. Add the onion and cook until it softens and begins to look translucent, 6 to 8 minutes. Add the beets and salt and toss to combine. Cover and cook for 10 to 12 minutes, until the beets are completely softened. Add the vinegar, toss to combine, and scrape up the browned bits from the pan with a wooden spoon. Set aside to cool slightly. In a mixing bowl, coarsely mash the beans with a potato masher or fork. Fold in the beet mixture, the rice, parsley, and black pepper to taste. Adjust seasonings. Shape into six patties, flattening to a ½-inch thickness. In a sauté́ pan, heat the remaining 2 tablespoons oil over high heat. Add the patties, in batches if necessary to avoid crowding. They should sizzle—this creates a nice crust. Cook for 1 minute. Reduce the heat to medium and cook for 2 or 3 minutes. Carefully flip the burgers and cook until browned and firm, 4 to 5 minutes longer. 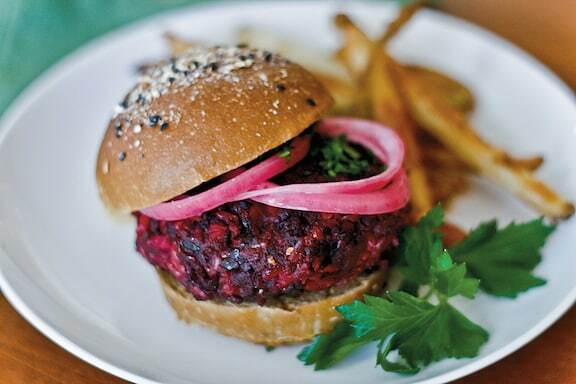 Here are more recipes for tasty vegan burgers. I’ve heard that these are very good. Do you think there is anything that could be substituted for the beans and the rice so these could be made for Passover? Maybe quinoa for the rice, but I have no idea about the beans. I always use a beet in place of the shankbone on the seder plate and then never know what to do with the beets. Making these would be a good use of them if I can figure out what to do instead. Thanks!